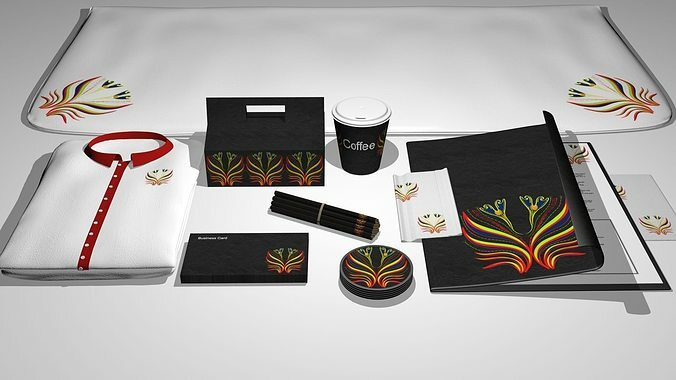 This model is specifically designed for branding, to show the customer what your design look like before any printing. Easy to use texture maps All textures are in Photoshop format with layers and the logo on each texture map is easily replicable. Instructions: Each product has a texture map eg. Folder_Texture, Shirt_Texture, Business Card_Texture, Cloth_Texture, Cup_Mat_Texture, Cup_Texture, Box_Texture, Paper_Texture, Pencils_texture, Serviet_Texture and Shirt_Texture. These are all .PSD (Photoshop) file formats and can be used to replace with your Logo design with our temp logo. Material textures and bump maps are in.JPG and easily replaceable with your desired material. Available in OBJ.RAR and 3DSMax2014.RAR Please note that the file size is large due to the .psd files. Textures and materials will load with .obj file.